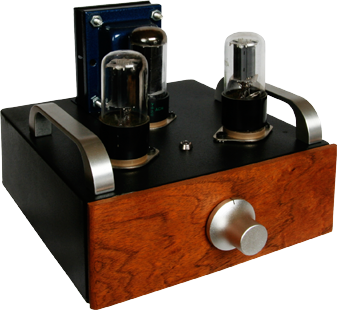 Again, I’ve designed my stereo preamps with simplicity in mind. All it has for controls is one volume/input attenuator. I design it specifically for the audio system that uses a CD player as the main input device. CD players inherently are rather harsh to the ears producing “listener’s fatigue”. I’m no expert on this. But I know what my ears like. Running the output of your CD layer through a tube seems to remove the digital artifacts and add organics/life to the music. My preamp has only one input/output per channel (although a 2nd/3rd channel can easily be added). I came across a load of Bendix 6AX5 full-wave, indirectly-heated rectifiers. In case you didn’t know, Bendix made tubes for high-stress environments. They were built (or over-built) to military specifications. The indirectly-heated cathode allows for a natural “soft-start”. So your tubes will not be slammed with high voltages before they’re producing electrons (preventing what’s called cathode stripping). 6 or 12SN7’s are used for the amplification. I’m using native Texas Mesquite for the faceplate. The result is clear, natural and beautiful to behold.